Sophie Jaffe is a certified raw-food nutritionist and raw-food chef. She's a member of the Yoga Alliance as an advanced teacher and is certified by the National Academy of Sports Medicine as a personal trainer. After managing a raw-foods store in Los Angeles that specialized in group cleanses, she became dissatisfied with the "one size fits all" model of detox regimens and created her own company, Philosophie. Starting your morning with yoga is a powerful way to connect to your breath and set a peaceful, grounded tone for what will follow in the hours ahead. Doing these eight energizing poses as soon as you open your eyes is a softer, easier way to fully wake up. Even better?You can do them without leaving the warmth and comfort of your bed! On mornings when I need the extra boost or have early commitments, I use the Yoga Wake Up app, which is an alarm that wakes me up with an audio-based yoga sequence by teachers I know personally, like Jen Smith and Derek Beres. After a sunrise practice, I feel rejuvenated, calm and ready to take on the day! 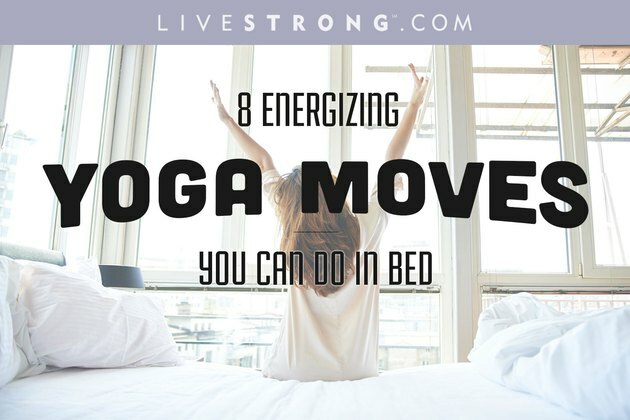 Try these eight poses and see how they can help you start your day right. From a kneeling position, lower your bottom down and between your feet. Then extend your torso and arms out in front of you between your thighs. Allow your forehead to rest on the bed. Breathe and hold the pose for 30 seconds to a minute. 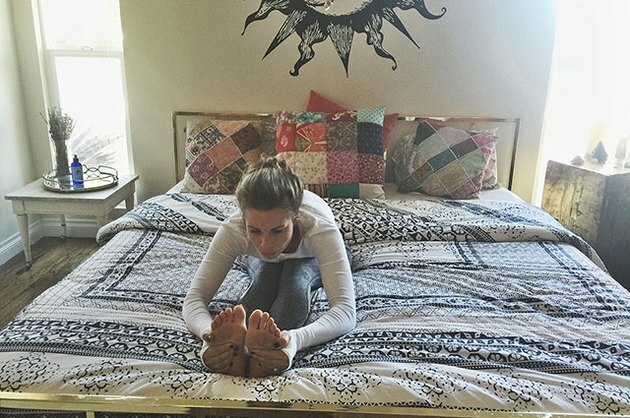 Start with your hands and knees on the bed, and make sure your wrists are in line with your shoulders and your knees are under your hips. Inhale, then exhale as you gently round your spine up into Cat while keeping your abdominals engaged and allowing your chin to drop to your chest. Inhale, and then exhale into Cow by arching your back, lifting your head up and letting your belly relax. Flow back up into Cat and repeat, warming up your spine. From a seated position, extend your legs in front of you and flex your feet. Lift your arms up and then reach for your feet or ankles, making sure to remove any curvature from your spine. Breathe and continue to bend forward, maintaining relaxed shoulders and a flat back. Hold for 30 seconds to a minute. Lying on your back, bring your right knee into your chest and gently lower it over the left side of your body. Draw your right arm (and your gaze) out to your right side and place your left hand on your right knee. Hold for five to 10 breaths and then repeat on the opposite side. Begin lying on your back with your legs together and your arms close to your body. Bend your elbows in and lift your palms up to the sky with your fingers pointing up. Exhale, push into your elbows, lift your chest to the sky and place the crown of your head down onto the ground. Keep your legs active, and squeeze your shoulder blades on your exhalations. Continue to breathe, expanding your chest, for 30 seconds. Lying on your back, bring your knees into your chest and gently take hold of the edges of your feet. As you release into your hips, allow your lower back to spread onto the bed, ensuring your ankles are stacked over your knees. Try to touch the tip of your tailbone to the bed. Breathe and hold for one minute. From a low lunge with the right leg forward, extend the left leg back with the top of your foot flat, and then bend the right leg, squaring your hips. Lengthen the spine and exhale, folding forward over the front of the leg with your arms, chest and head. Breathe for one minute to three minutes and repeat on the other side. Sit on your sit bones with your legs crossed and feet relaxed. Lift your spine straight to the sky and allow your hands to rest on your knees with the palms facing down. Practice breathing, and savor the peace and tranquility of the moment. Sophie Jaffe is a certified raw-food nutritionist and raw-food chef. She’s a member of the Yoga Alliance as an advanced teacher and is certified by the National Academy of Sports Medicine as a personal trainer. After managing a raw-foods store in Los Angeles that specialized in group cleanses, she became dissatisfied with the one-size-fits-all model of detox regimens and created her own company, Philosophie. Follow Sophie on Facebook,Twitter, Pinterest and Instagram.